1. Best balinese dance class studio in Jakarta (By balinese representative goverment in Jakarta). 2. Held a balinese dance competition between schools in Jakarta. 3. First place in balinese dance competition held by FTB,MGG, ITB Bandung. Won a trophy given by Minister of Tourism and Bali governor (February 2008). 4. Won a trophy from Bali governor and director of Taman Mini Indonesia Indah at Festival Pendet Dance for JaBoDeTaBek (Jakarta, Bogor, Depok, Tanggerang and Bekasi). 5. Participate in promoting Indonesian culture internationally, supported by Indonesian Department of Culture and Tourism in Schezen, China. 6. First place in balinese dance competition held by FTB,MGG, ITB Bandung. Won a trophy given by Mentri Pariwisata and Bali governor (October 2010). 7. Won the 5th National Folklore Festival by Faculty of Economics, University of Indonesia (March 2011). 8. 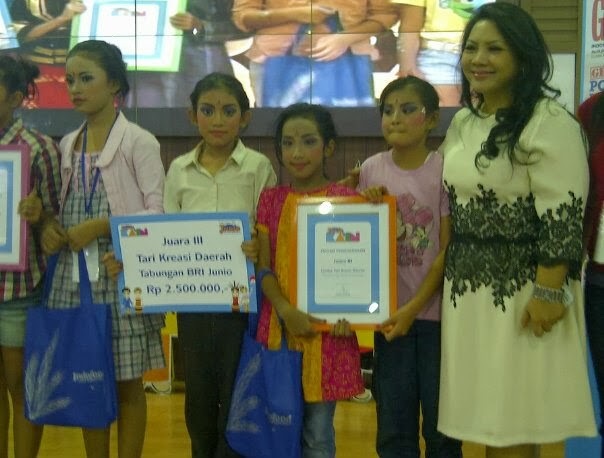 Third place in Traditional Dance Competition, held by Bank Rakyat Indonesia (June 2012).